A day after participating in The Undefeated's town hall, the athlete loses his cousin to Chicago gun violence. 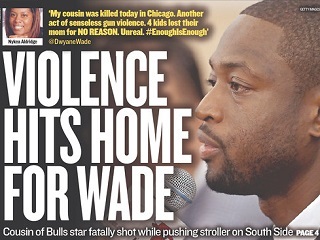 On Thursday, NBA superstar Dwayne Wade led off his portion of The Undefeated’s special town hall conversation about gun violence in Chicago by telling moderator Jemele Hill that his experience growing up in the city “was a lot of us killing us.” On Friday, a most horrific confirmation that this is still the case occurred. It was 3:30 p.m. in the afternoon. Wade’s cousin Nykea Aldridge, 32, was pushing a baby stroller and on her way back from the Dulles School of Excellence after registering one of her other four children for the school year. The man she was walking with may have been targeted; she was shot in the head and arm; she died, later, at the hospital. Police said the suspects were targeting a for-hire driver after exchanging unfriendly glances with the man as he drove in the neighborhood. The two later confronted the driver after he walked two women into their building, according to prosecutors. The driver told police the men menaced him and indicated they had guns. They then chased the driver as he ran away, with at least one of the men firing multiple shots that struck Aldridge.